We’re running out of things to post, but I will post this spectacular vocal performance of Hugh Panaro, performing one of my favorite tracks from the ill-fated Lestat musical, Right Before My Eyes. I know there is a lot of antipathy towards the Lestat musical, as though the very notion of Anne Rice’s books becoming musicals is an anathema. I loved the musical, even from the low-quality tracks I’ve managed to find. Everyone has different preferences and expectations, when it comes to musicals, but I felt that the musical was pretty strong, considering how inherently difficult and taxing of a task bringing such a well-beloved, iconic “vampire” character to the musical stage is. 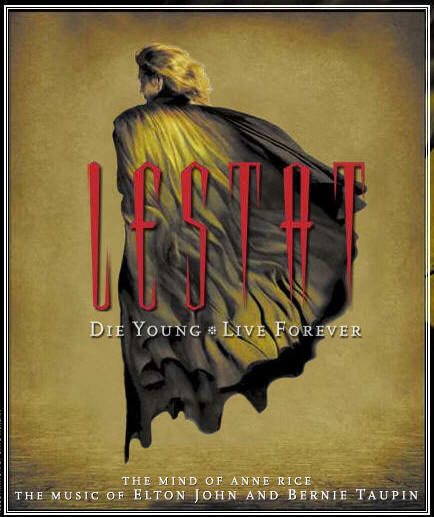 To showcase the short-lived legacy of the Lestat Musical, I will be posting rough cut videos of songs and performances, along with any and all interviews that I can manage to find for this entire week. This is to help celebrate the legacy of Lestat, and the musical, that has otherwise been submerged in the waters of forgetfulness. Also, below is a Youtube interview with both Anne and Bernie Taupin,one of the writers, behind this short-lived, though memorable musical (at least to my eyes). This should help better contextualize the talents behind this, and how supportive Anne Rice was of this musical (Tomorrow, I will post a link to a longer, more in-depth article, from her website that perfectly describes her praise for the musical). **Did you have a chance to attend the musical, during the short time that it ran on Broadway? Now be completely honest, did it live up to your expectations? Was it a technically good musical? Do you have any memories of seeing or attending it? Email me anything related to the musical, for being potentially considered to be posted here on my blog (as part of #28DaysofLestat) at narniafanatic@gmail.com. Previous Post #28DaysofLestat- Special “Vampire Chronicles” Psychoanalytic Essay, Published via Wattpad for a Short Time Only! Justin, I was lucky enough to attend one of the shows of the musical in San Francisco before it’s run on broadway. I will forever cherish that experience. Hugh Panaro was excellent. I also remember being very impressed with Allison Fischer who played our beloved Claudia. I thought it was wonderful. Personally, I love the music. I would love to see the lyrics for it. I won’t say how, but I managed to get a full copy of the music from the show and I still love it. 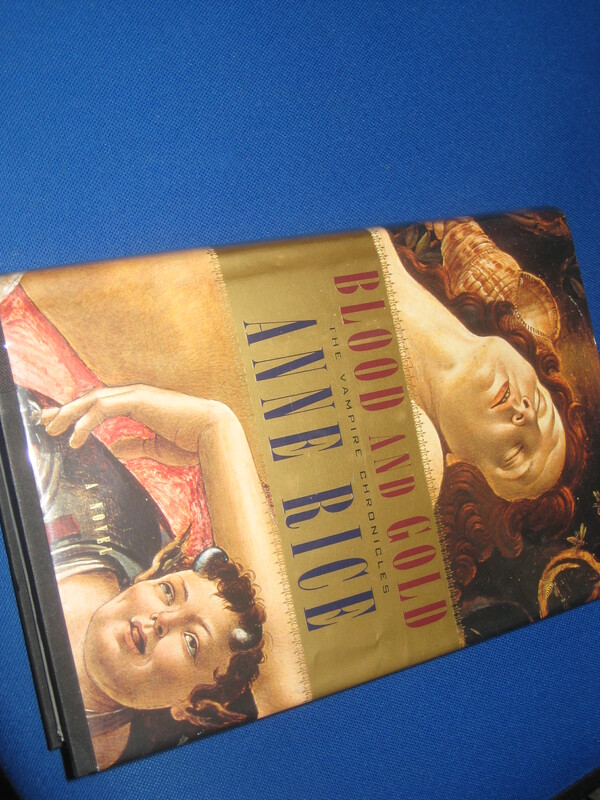 As with other Anne Rice projects, I thought the music was the best thing to come from this. I’m also a big fan of the music from the QotD movie, even though I hate the movie. I love the feelings the music expresses. As for 28 Days of Lestat I’d love to see some good synopses of the books. I really don’t have time to reread them all again. But I would like to get a good reminder of the stories. BTW, that clips of Hugh singing really got me! I love that song! Also, I’m so glad to see someone out there really taking Anne’s work seriously in an academic sense. I’ve been reading her work since I was in the 7th grade and have been arguing the relevance of her work since high school. Had my interests gone toward literature in college I’m sure that I would have focused on her work. However, she inspired me to go into history and archaeology. I’ve really enjoyed your blog. Thanks! Deanna, for your benefit, I am doing a recap. of discussions the coven has had in the past about the first three Vampire Chronicle books next week, which I hope will effectively get everyone planning to read Prince Lestat on the release date ( a good percentage of Anne Rice Fans). Also, thank you for leaving a comment on this otherwise empty comment thread. Getting some real comments (and not tons of spam ones) always makes me happy. And, I love hearing stories or accounts, from those that remember attending the Lestat musical. I cannot help but envy you a bit, since the Youtube videos only partially capture the true beauty and splendor of seeing such a musical live on stage. I would love a DVD made out of the musical, if old, archived footage of the musical exists. We deserve it, or at least an official recording of the songs. I feel like the company that owns the rights to the musical did very little to actually preserve some fragment of this ill-fated, underrated musical. Not everyone liked it, and they are entitled to their opinions, but I don’t see why Warner Bros. and anyone working on this is somehow ashamed of this work. I think it was pretty awesome, and much more honorable/faithful of an adaptation than that “Queen of the Damned” film.